The Noble Eightfold Path (Pali: ariya atthangika magga), according to Buddhism and as taught by Siddhartha Buddha, is the way to the cessation of suffering, the fourth part of the Four Noble Truths. It is summarized into three important categories: wisdom (pañña), virtue (sila), and concentration (samadhi). The following is An Analysis of the Path, a sutra or discourse delivered by Siddhartha Buddha from the Tipitaka, explaining this Noble Eightfold Path in detail. In all these, the word «right» is a translation of the word sammā (Pāli; Sanskrit: Samyañc), which denotes completion, togetherness, or coherence, and which can also carry the sense of «perfect» or «ideal». «And what, monks, is right effort? (i) There is the case where a monk generates desire, endeavors, activates persistence, upholds & exerts his intent for the sake of the non-arising of evil, unskillful qualities that have not yet arisen. (ii) He generates desire, endeavors, activates persistence, upholds & exerts his intent for the sake of the abandonment of evil, unskillful qualities that have arisen. (iii) He generates desire, endeavors, activates persistence, upholds & exerts his intent for the sake of the arising of skillful qualities that have not yet arisen. «And what, monks, is right mindfulness? (i) There is the case where a monk remains focused on (his/her) body in & of itself.. ardent, aware, & mindful..putting away greed & distress with reference to the world. (ii) (He/she) remains focused on feelings in & of themselves..ardent, aware, & mindful..putting away greed & distress with reference to the world. 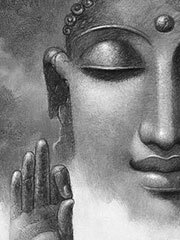 (iii) (He/she) remains focused on the mind in & of itself..ardent, aware, & mindful..putting away greed & distress with reference to the world. (iv) (He/she) remains focused on mental qualities in & of themselves..ardent, aware, & mindful..putting away greed & distress with reference to the world. «And what, monks, is right concentration? (i) There is the case where a monk..not ardent, quite withdrawn from sensuality, but mindful and alert, enters in the first jhana: rapture & pleasure born from detachment, accompanied by directed thought & evaluation. (ii) With the stilling of directed thought & evaluation, he enters & remains in the second jhana: rapture & pleasure born of concentration; fixed single-pointed awareness free from directed thought & evaluation; assurance. (iv) With the abandoning of pleasure & pain..as with the earlier disappearance of elation & distress..he enters & remains in the fourth jhana: purity of equanimity & mindfulness, neither in pleasure nor in pain. In the Great Forty Sutra (Mahacattarisaka Sutta), which appears in the Pali Canon, the Buddha explains that cultivation of the Eightfold Path leads to the development of two further stages once enlightenment has been reached. These also fall under the category of pañña and are Right Knowledge (sammanana) and Right Liberation (or Right Release; sammavimutti). Some consider Right Association as an implicit ninth aspect of the Path.